Do you ever feel like you could have at least one more appetizer to serve your guests, but just don’t have the time to whip another one out? This recipe is so simple, even your kids can put it together. Whether you serve this as an appetizer or with brunch, it’s certain to disappear quickly. With simply 6 ingredients you can have this mouth-watering appetizer ready in a flash. This recipe is so delicious and takes no time at all. Prepare your balsamic reduction ahead of time along with crostini. Then simply dress the baguette slices and your ready to serve in 10 minutes or less! Balsamic Reduction: Using 1 cup or a full bottle of basic balsamic vinegar, pour into a heavy bottom pot; leave uncovered . Bring to a low boil, then reduce to a simmer and allow to reduce by half or until thickened. Allow to cool. Once cool, pour into a squeeze bottle with tip or cover bottle to keep fresh until ready to use. Place whole grain baguette slices on a foil lined sheet pan and brush one side with extra-virgin olive. Lightly sprinkle with salt. Place baguettes into a preheated 425F degree oven for approximately 20 minutes or until bread slices are golden brown or to your liking. Remove and allow to cool. (Can be done ahead of time and placed into zip lock baggie until ready to use). To Serve: Set baguette slices on a platter. Cut 1/4-inch slices of goat cheese to place on each baguette. 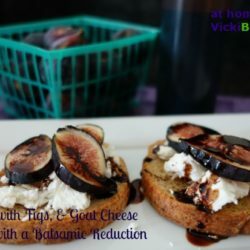 Set 1/4-inch slices of fresh figs on top of goat cheese, then drizzle with balsamic reduction. Enjoy and watch as they quickly disappear! Be sure figs are ripe - soft to the touch, not firm! 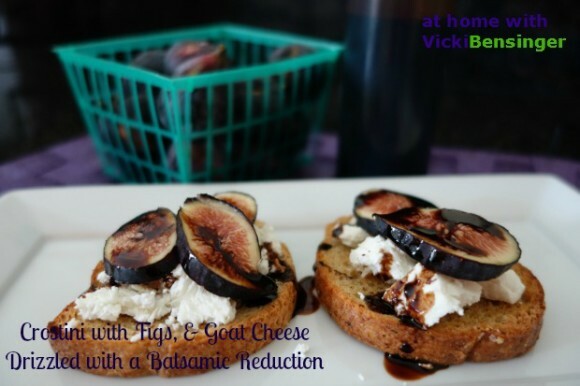 Balsamic Reduction makes a nice gift for the holidays!